Mix all dry ingredients, then add skim milk and vanilla to blend. Add peanut butter and mix w/ hands. 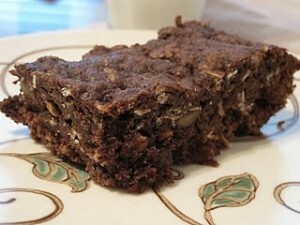 Put mixture in an 8×8 pan, press flat, refrigerate for 2-3 hours and cut into squares. Tried this recipe and it was extremely easy and delicious. I added dark chocolate chips for my sweet tooth.